Mobile gaming on phones is great and everything, but our thumbs tend to get sore trying to mash virtual buttons on touch screens. We wouldn’t dream of giving up our games, though, so it only makes sense to find a better way to play. The PhoneJoy Play is that better way – it’s a gaming controller that pairs with your smartphone and essentially lets you play your cool phone games with traditional easy-to-use buttons. 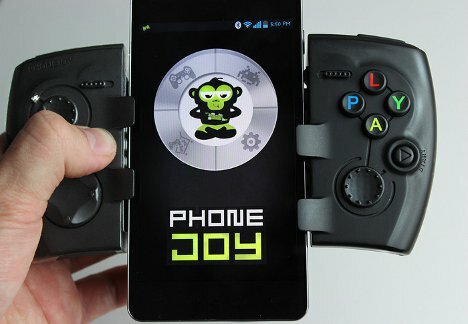 The PhoneJoy Play can be used in its closed position to play via Bluetooth on your computer or tablet, but it really shines when you extend it and slot your smartphone into the space between the two game controller halves. With the phone in place, the entire assembly looks just like a handheld video game system. The controller takes away the frustration that comes with trying to control a game via touch screen controls. It’s wireless and fits in your pocket, so it can go everywhere that your smartphone goes with you. The project has already reached its funding goal on Kickstarter and promises to revolutionize the way we play games, both at home and on the go. See more in Gaming & Geek or under Gadgets. January, 2013.